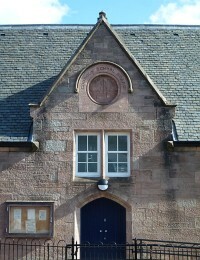 John Honeyman & Keppie made considerable additions and alterations to this pink sandstone school with simple pointed-arch gable-end windows, originally designed by John Honeyman in 1876. Their work in 1893–4 included a new entrance and belfry. The neighbouring Old Gourock Church was extended and altered by the practice in 1898–1900.